This is a TV user’s question asked not long ago, as more and more HDTV or smart TV coming up, many people want to play high-definition movies on TV, like Blu-ray 1080P on TV, they can get better visual enjoyment. But, many users maybe new to this application, this article will tell you how to play Blu-ray on TV via USB flash drive. In order to play Blu-ray disc movies on TV, you will need to rip Blu-ray to common video formats that supported by TV, such as MP4, MKV format. So you need a Blu-ray Ripper for TV, with the Blu-ray Ripper software, you can convert Blu-ray movies to TV supported formats, and then you can copy converted Blu-ray movies to USB flash drive for watching on TV. Now you can follow the easy stepson below which shows the way to convert Blu-ray to TV compatible formats with the best Blu-ray Ripper for TV. 1. Download and install Blu-ray Ripper or Blu-ray Ripper for Mac, this software can help you convert Blu-ray disc movies, Blu-ray ISO movies, DVD disc movies, DVD ISO/IFO/Folder movies. You can free download our Blu-ray ripper here. 2. Import the Blu-ray movies that you want to convert, and then choose main movies from the list, usually the main movie has the longest playback time. 3. Choose the output format, to convert Blu-ray to TV, you can choose HD MP4 as playback format, it’s the best compatible format for TV and portable devices. Just click and choose HD Video -> H.264 HD Video (*.mp4). 4. After choosing the output format, you can click settings button in the main interface of the TV Blu-ray converter, you can adjust the output parameters as you want, for example, you can customize the resolution, bitrate, etc. suggested resolution is 1920*1080 (1080P), 1280*720 (720P), and bitrate as 4000-8000 kbps is appropriate. 5. You can also edit the Blu-ray video before conversion, the useful features include trim, crop, add watermark, adjust effect, 3D, etc. 6. 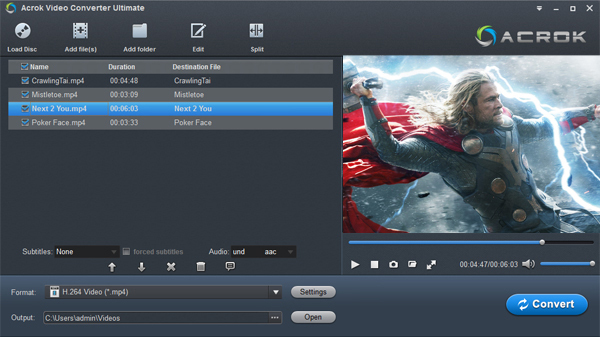 Click convert button to start the Blu-ray movies to TV conversion. This best Blu-ray to TV Converter equipped with NVIDIA CUDA and AMD APP acceleration technology, so it can convert Blu-ray to TV at a fast speed. Blu-ray movies always have large volume, so it may take some time to convert. After conversion, you can transfer converted Blu-ray movies (MP4 format) to USB flash drive, and then you can play Blu-ray on TV via USB storage. Details about how to play USB content on TV, please read your TV instruction, it’s easy.